The theatrical release of the original Tremors in 1990 combined suspense-filled action, sci-fi imagination and witty humor in the tale of a tiny Nevada town terrorized by giant man-eating worms known as Graboids. The Graboids eventually morphed into even more deadly creatures known as a** Blasters. 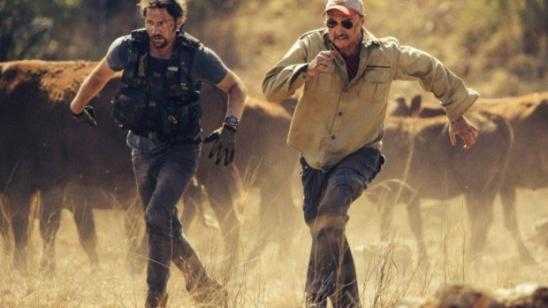 In this all-new adventure that travels halfway around the world to South Africa, the Graboids and the a** Blasters are not only bigger and badder but Tremors 5 introduces an additional unexpected surprise that raises the stakes in the battle for survival. The film is directed by Don Michael Paul (Jarhead 2: Field of Fire, Sniper: Legacy) from a script by John Whelpley (Tremors 3: Back to Perfection) and produced by Ogden Gavanski (The Scorpion King 4: Quest for Fire, Warm Bodies). Official Synopsis: The giant, man-eating Graboids are back and even deadlier than before, terrorizing the inhabitants of a South African wildlife reserve as they attack from below-and above.